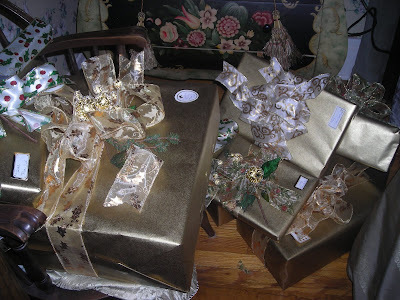 Lines from Linderhof: The Packages Were Wrapped . . . The guest room is where the package wrapping activity takes place. With my roll of gold paper and various spools of ribbons, I take our carefully selected gifts and transform them into Christmas packages! 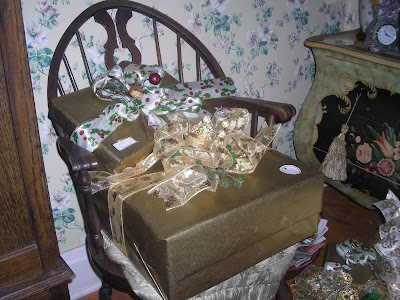 I've always loved wrapping presents and the first Christmas that I purchased gifts for the family, I spent HALF of what I was given to buy papers and ribbons and glue and glitter so that the outside of the packages were as neat as the gifts inside. I still like to make pretty packages! It was snowy yesterday and cold and so with The Three Tenors Christmas album on the stereo I spent most of the morning creating beautiful presents to be opened Christmas morning. I've a few more to wrap but soon all the presents will be under the tree. A small sea of gold around our glittery Christmas tree. "I like to make pretty packages." I think you've outdone yourself, your packages are beautiful. I love your presents, all in gold. And the ribbons make the packages looks just so lovely.